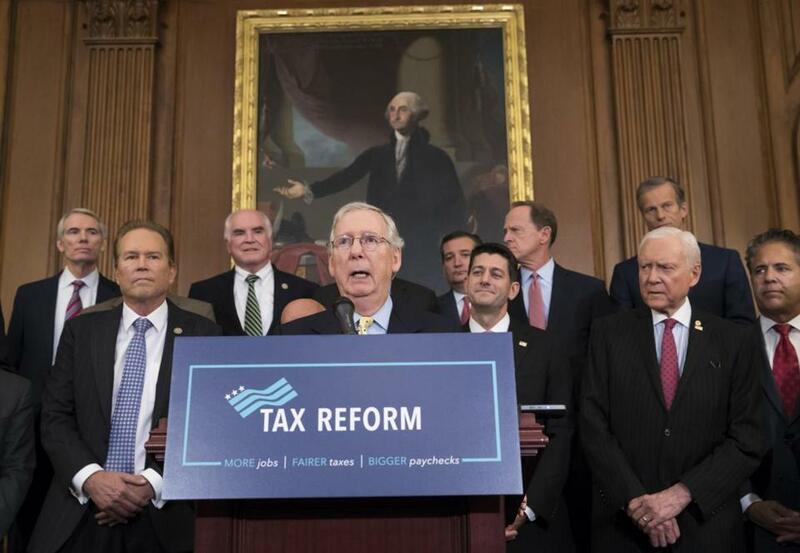 Senate Majority Leader Mitch McConnell joined other GOP lawmakers to talk about the Republican tax proposal. WASHINGTON — President Trump said the economy, corporations, and average American workers would all be winners under the GOP’s ambitious tax overhaul that he outlined Wednesday. But the blueprint also would create losers: People who pay state and local levies in high-tax blue states, including Massachusetts. To offset the huge loss in revenue from his proposed tax cuts, Trump and GOP congressional leaders want to eliminate widely used personal income-tax deductions for state and local income taxes and property taxes, among others. Massachusetts ranks fifth among states where residents would see the largest average federal tax increase if the deductions are scrapped, behind Connecticut, New York, New Jersey, and California. Homeowners in Massachusetts and throughout New England pay steep property tax bills to support local town government, in addition to their state income taxes. Property taxes are especially high in cities and towns with hefty real-estate values and heavy demand by residents for high-performing public schools, such as Boston’s suburbs. Being able to deduct those state and local taxes on annual federal tax returns reduces the sting. 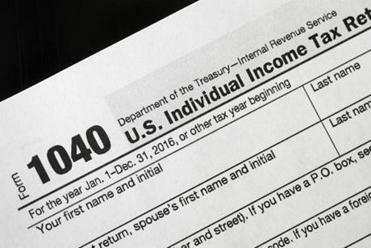 Some Massachusetts officials quickly opposed eliminating the deductions, saying it would hit many on all rungs of the economic ladder. For Massachusetts residents, a provision that would eliminate some deductions could prove costly. The steep cuts in the tax rates for businesses and individuals proposed by Trump and congressional GOP leaders would leave gaping holes in the federal budget. Ending the popular state and local tax deductions would yield $1.3 trillion to $1.8 trillion for the government to help pay for tax cuts elsewhere, including lowering the corporate rate from the current 35 percent to 20 percent. White House officials, GOP congressional leaders, and others who favor killing the deductions argue they mostly benefit the wealthy. Conservative tax activists say they encourage states and localities to spend residents’ hard-earned money with abandon. In his speech in Indiana, Trump pledged that the tax plan would prioritize low- and middle-income taxpayers over the wealthy, eliminating itemized deductions he says primarily benefits the nation’s highest earners. “And it’s not good for me, believe me,” said Trump, who owns high-end real estate in some of the most expensive communities in the country, especially midtown Manhattan and Palm Beach. Trump will find protests from within his own party, however. Targeting the state and local tax deductions sets up a fight that will run along regional, rather than political lines. Particularly in the House, GOP lawmakers from New York and New Jersey have already declared their opposition to scrapping the deductions. That could give Republican leaders serious heartburn as they try to craft and move their tax plan to the president’s desk. New York Republican Representative Claudia Tenney quickly came out with a statement saying she and other members of the state delegation would oppose the move. She was one of seven New York Republicans who wrote Treasury Secretary Steven Mnuchin in June, urging him not to take the provision away. “Any tax reform legislation must retain the state and local tax deductions. Hard-working New Yorkers must not be taxed twice,” said New York Republican Representative Peter King. He has predicted there’s enough GOP opposition in the House to sink any attempt to cut the deductions. Representative Richard Neal of Springfield, the highest-ranking Democrat on the House Ways and Means Committee, said Republicans are failing to see the risk for defection from their own party. Without this provision, about a third of Americans would owe more money to the federal government. Pressure would build on smaller-scale government to cut spending. The elimination of the deduction could also harm a potential homeowners’ ability to pay a mortgage, said Paul Yorkis, president of the Massachusetts Association of Realtors. Yorkis, who has been a realtor in the state since 1991, said the Republicans’ plan could make it more difficult for young people to buy their first home, especially in a state like Massachusetts with high home prices and real estate taxes. Trump’s tax framework, which was unveiled in a speech in Indiana on Wednesday afternoon, proposes the first comprehensive rewrite of the federal tax code in 30 years. Eliminating the deductions is not an automatic deal-breaker for all Democratic Massachusetts lawmakers. Representative Michael Capuano of Somerville said although he opposes eliminating the deductions, he needs to see the full picture of the tax reform bill before he makes a judgment. The last major debate over local and state taxes occurred in 1986, during the Reagan administration. Although President Reagan backed eliminating them, once the bill reached committee, there was a full-throated bipartisan rebellion of legislators who feared the shift would harm their states. “It died in committee and never rose again,” said Martin Sullivan, chief economist at Tax Analysts, a nonpartisan, nonprofit policy organization based in Virginia. Victoria McGrane can be reached at victoria.mcgrane@globe.com. Follow her on Twitter @vgmac. Julia Jacobs can be reached at julia.jacobs@globe.com.